Good Job! And I as always say, I'll rather be asked questions than be stared at. I just wish more parents did what you describe. For many it's just not on their radar. wonderful post...This post is definitely so helpful.. I don't get stared at for being autistic, but rather for my attention-grabbing wardrobe choices. On some days, I look like a walking glow stick and it doesn't concern me. If someone stares curiously or out of genuine interest, it means they care enough to notice, but are too shy to comment. If it is a dirty look, it means they are 1) jealous because they cannot pull off this style, 2) lacking in respect of alternative styles and other differences, 3) or just don't know how to react to something that doesn't fit the standard of normal. These people are not worth my time and energy. I'll let them deal with each other. We are quite deliberate in talking to our children about these issues, but one of things I've found is that none of these discussions are meaningful without people to attach them too. I can talk about Downs Syndrome 'til I'm blue in the face, but the kids don't understand it (and, even, take my words and mis-interpret them into a skewed model, like, for example, thinking that a child with Downs might have an extra body part, instead of an extra chromosome). They do understand, though, when I talk about M, and why she might seem different from the other kids (and, they can also see a lot of the ways in which she is the same). 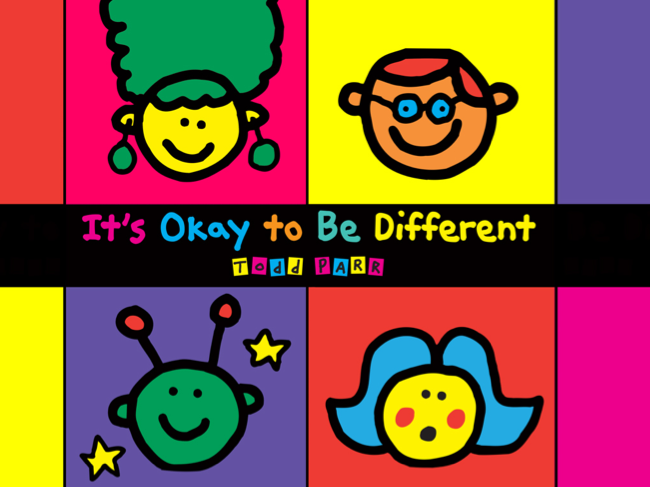 I don't think its possible to teach kids about people with disabilities without the people being part of their lives (the same, is true, about race and culture). That's why diversity in environment matters so much to us. We do not always have all forms of diversity in our personal environment, though, and that's one of the reasons I do appreciate these blogs so much. Max seems very real to me, though I only know him on the internet. That makes it possible for my kids to know him, a little bit, too. (PS: I do think the question about gibberish might be a bit different then it was at first glance -- the kids actually do speak something they call "Gibberish" for fun -- that is, trying to speak without a recognizable words, so, one interpretation of the girls' question is whether M was speaking "Gibberish", rather than a comment on the quality of his speaking). I work with a group of kids (1st graders) who have never been around children with special needs. This became painfully obvious to me in the first few weeks of school when they would laugh at a child in our class whenever he talked and when they stared at one of our middle schoolers who uses a walker to navigate the hallway. I don't understand many things in my student's culture (I am very much an outsider! ), but this was one that hit me hard. I grew so frustrated with the class as a whole, specifically about the laughing at their classmate part, and in my frustration, shared a story about 2 little boys that I used to work with: 1 with CP and another "typical." The one boys only concerns about his 5th birthday party centered around making sure his friend with CP could participate; he made his mom call the bowling alley to make sure they'd have a ball ramp available and then had her call his friend's mom to make sure she would bring his kid walk home from school that weekend. I told them that I wanted them to be that type of kid. In case anyone is wondering, here is how I explained CP to my first graders (we were working on a unit about the human body at the time, which was very handy!!! ): The brain doesn't send the right signals to the muscles. A person may be able to think about what they want to do, but the wrong messages go to the nerves and so the muscular system doesn't work like it's supposed to. I hear you, however, my sense is that if a parent is ready to do what you suggest, his/her children are not the ones who need to be taught about disability. It never occurred to my husband or myself to specifically address the issue of disability, but our kids have been exposed to much diversity and have obviously felt that we were appreciative of differences and not judgmental abut people’s choices. A few months ago, my son’s teacher told me that he was by far the sweetest kid in his class in the way he dealt with a girl with CP. I didn’t even know there was a girl with CP in his class, so I asked him why he did not tell him about her. His answer was: I did tell you about her, her name is Lisa and she really enjoys my jokes. Great idea. I will start immediately. I do have to say before my daughter Kelsey was diagnosed with autism at 3, I really didn't address disability with my older boys who were 5 and 7 at the time. I vividly remember telling my son not to stare at a man in a wheelchair. I regret not using that moment as a teachable one, but I didn't know how to. 3 years later I do. And we love My Brother Charlie. One thing I love about my son's school is the way disabilities are normalized. Children are mainstreamed as much as possible, and "normal" kids will be paired up with kids that need help (think pushing a wheelchair, carrying books for a child in a walker, or being a playmate at lunchtime). I don't remember ever seeing a child in a wheelchair growing up. There are dozens at my son's school. Are some kids still mean? Yes, but it's not the norm and is dealt with promptly. All the kids benefit from exposure to children that are not just like they are. 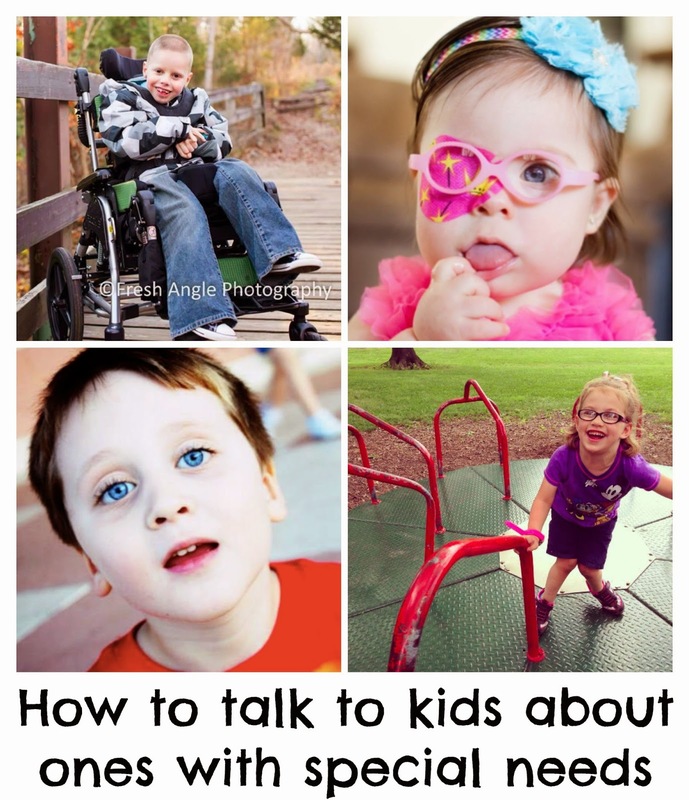 My kids are familiar with several disabilities - my dad/their grandpa's blind, cousin on the spectrum, daughter's BFF has one hand - and, when they encounter a someone with a disability they aren't familiar with, making an observational comment, eg "your wheelchair is fast/ sparkly", "your service animal is fluffy", etc. My girlies are 5 and 7, so I'm walking a fine line between not wanting them to pretend folks with special don't exist (which is, I think, what happens when kids get "shushed") and not teaching them to ask too-personal questions of total strangers (the checkout lady at the supermarket, substitute teacher, etc). The flipside of the too-personal-questions issue is that folks tend to assume they're adopted don't believe them when they say they aren't. Teaching them to (politely) shut down strangers is an ongoing process. (Girlies look exactly like their Chinese daddy and nothing at all like pale, redheaded, freckly me). This is a great idea. Any parent can talk to their child over and over again and they still may say "ew". Children are just children, don't let it get to you. I always like to surprise kids, even after they've said something not so nice about my client. I would've answered that little girl and said "ew, what? This is my son, he was trying to say hi" and showered her with kindness. Kids are not innately mean, they need us to.understand just as much! Some adults need to read this to improve their OWN behavior. Awesome article!! I am a parent of 2 children with special needs and I am also a special needs photographer. Thanks for featuring my image above!! Special needs kids are kids too. "Typical" kids just need things explained to them; we teach our kids about everything else, we need to TEACH them how to ask questions and accept people for who God made them. I'm cringing so much as I read this post. There is a great post on this topic which all of you should read. http://agirlnamedcharlie.blogspot.co.uk/2014/09/looking-past-disability.html.